4% of Latin America and the Caribbean’s GDP comes from the extractive sector. This figure is equivalent to the amount generated by agriculture in the same region. An effective engagement between governments, companies, and civil society is required to propel sustainable development. With this diagnostic study of the Dominican Republic, the IDB seeks to shed light on best practices among stakeholders of the extractive sector. It focuses in actions of information, dialogues, consultations, collaborations, and partnerships that are driving development in the country. This booklet focuses on the findings of the Dominican Republic and is part of a regional diagnosis executed in Argentina, Chile, Colombia, Mexico, Peru, and the Dominican Republic. 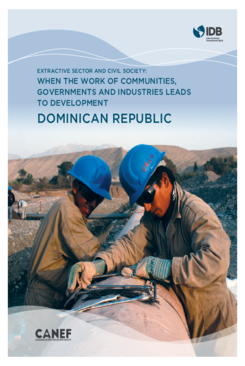 The full publication is available at https://publications.iadb.org/en/extractive-sector-and-civil-society-when-workcommunities-governments-and-industries-leads.